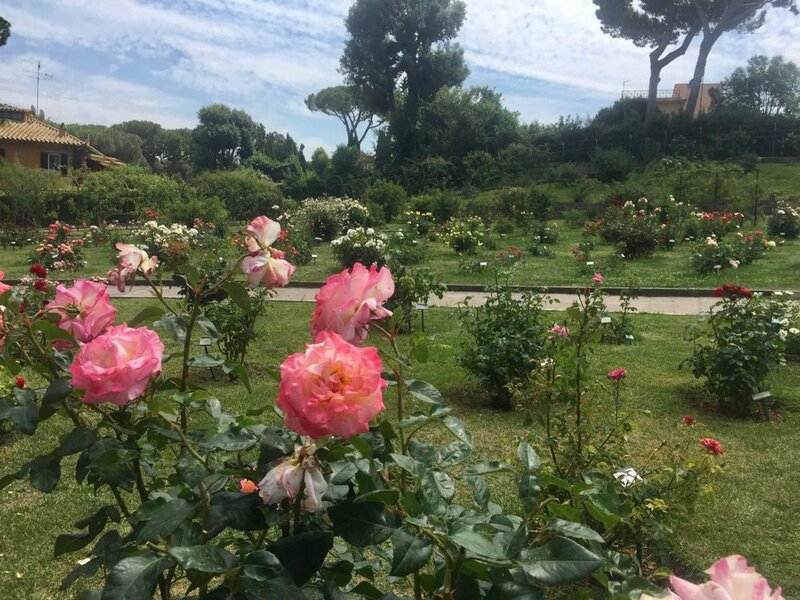 Rome's rose garden is absolutely beautiful and even more special because it's only opened for a limited time in the spring. I've been trying to get to the gardens for years, but always missed the month or so that they're open for. No more! I went with my visiting friend and had a lovely time wandering through the rows of rose bushes and checking out the pathways that surround the garden, enclosed by rose arbors. If you're a fan of gardening, beautiful flowers, or parks, this stop is a must-see in Rome. Walking into the garden is a beautiful experience. Everything smells lovely, you're surrounded by greenery and beautiful flowers, intertwined with the winding garden pathways. The garden boasts over 1,000 different species of roses so there's plenty to see if you're at all interested in flowers. Over the Italian Stone Pines, you can make out glimpses of Circus Maximus and Rome's skyline. In one garden, there's a pergola and low hanging tree that invites you to climb it. On the other side of the road, you can walk the perimeter of a second garden under an arbor of roses and take a long break on one of its many benches. Just like the orange gardens, Rome's rose garden is perfect for a quick snack and glass of wine (maybe a nice rosè ;) ). You can bring your own food in, find a seat and spend hours talking with friends or just enjoying the scenery. It's right in the center of Rome and yet you feel a million miles away. I highly recommend, 10/10. While we wandered the gardens, we saw a couple of parties going on. While I couldn't find any official information online about hosting events in the gardens, I think informal gatherings like the ones I saw would be perfectly fine. Go with your group, dress up and take pictures among all the different rose bushes. Finish up with wine and snacks and you have the recipe for a perfect aperitivo. I just missed posting this in time—unfortunately the rose garden is closed for 2017 but for future plans, I would definitely recommend checking it out if you have a free afternoon. While these dates may change depending on the year, it's typically open from April 21 to June 19, everyday from 8:30-7:30. The garden is very close to the Circo Massimo metro stop and an easy way to spend an afternoon in Rome (especially because it's FREE to enter). You can continue your way up and check out the Orange Gardens along with the secret keyhole that looks through a garden to St. Peter's dome. For more information, check out Rome's official tourism site here.